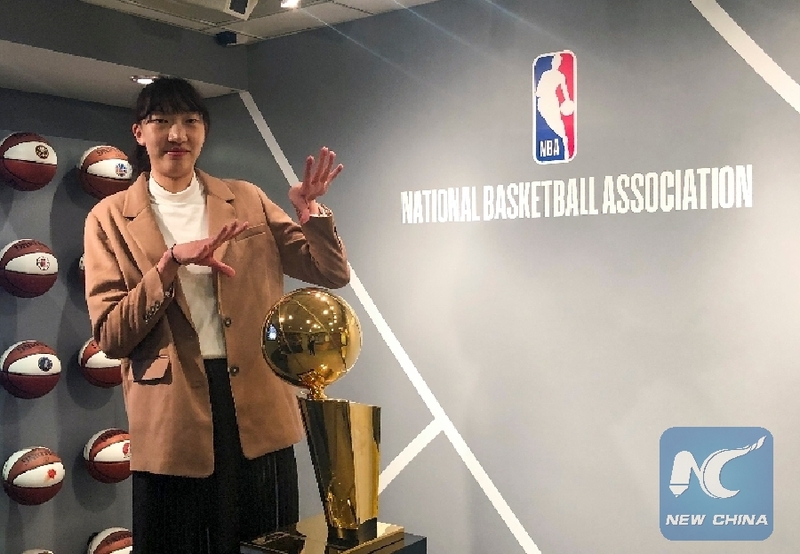 NEW YORK, April 12 (Xinhua) -- Han Xu, a 19-year-old promising center of the Chinese national team, has fulfilled her dream of playing in the WNBA, the world's highest-level women's professional basketball arena. In an exclusive interview with Xinhua after being selected by the New York Liberty in the WNBA Draft 2019 on Wednesday night, Han, 2.07-meter tall, said, "I had a dream of playing on better-to-best platforms when I started basketball training 10 years ago." "I began to pay close attention to the WNBA when I was in high school, but I buried the dream in the bottom of my heart as the future was uncertain at that time," she said. "After I had the experiences in the Chinese junior and senior national teams, I felt the chance approaching." As a newcomer, Han devoted the team-high of 20 points in the China-U.S. encounter in the group stage of the 2018 World Cup in Spain. Her superb pace and shot as well as the match-reading ability stunned the Americans. Although China lost the game 100-88, the 12-point margin was the smallest between the two in more than 30 years. China followed the U.S. into the knockout stage and finished 6th in the 16-team tournament. Recalling that game, Han said, "That was a game I played under least pressure. Facing such strong opponents, I had nothing to fear and totally concentrated on the game. My teammates also played well, such as Sun Mengran who collected 16 points." As to her past, Han said, "My parents were basketball players. I have been taller than others since I was young. I thought I must have something to do with basketball this life." Yao Ming, former NBA star center and incumbent Chinese Basketball Association (CBA) president, has ever said that more and more Chinese basketball talents will come from campuses and middle schools. As one of the talents, Han said, "In the six-year period of middle school, I took curricular courses everyday in morning and afternoon, followed by basketball drillings. It needed a proper time arrangement and role switching." "My school has professional basketball coaches and the basketball-oriented students including me have many chances to take part in competitions, even international ones," she added. Graduated from the middle school, Han turned to a professional player joining WCBA side Xinjiang Tianshan. In her first season in 2018, Han averaged 15.9 points, 8.9 rebounds and 2.1 blocks to help Xinjiang advance to playoffs. She was selected into the WCBA All-Star starting line-up and went to the World Cup with the national team before coming to the United States for the draft. Han said, "During my stay in Los Angeles this year in preparation for the draft, the coach of New York Liberty came to see my training." "I can feel the hospitality of WNBA. And I don't mind being picked in the first, second or third round. The most important thing is I've come to WNBA and I'll try my best here," Han noted. The New York Liberty finished 11th in the 12-team WNBA last season and their 7-27 record was the worst in franchise history following an 11-23 season in 2013. Han expressed the hope to have more playing time to make contribution to the Liberty. Talking about her future life in New York, Han said, "I like taking pictures in tours, but I don't think I have enough time. So far, I focus on learning English after training. Since I played in WCBA last year, I've been learning English with some tutors." Han was selected by the New York Liberty as the second pick in the second round and the 14th pick overall. At the ceremony, Han said in English, "I am very excited as the dream comes true."